For other people named Blagojevich, see Blagojević. Rod Blagojevich    ( /bləˈɡɔɪ.əvɪtʃ/, born December 10, 1956) is an American former politician who served as the 40th Governor of Illinois from 2003 until his impeachment, conviction, and removal from office in 2009. 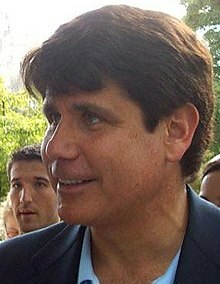 A Democrat, Blagojevich was a state representative before being elected to the United States House of Representatives representing parts of Chicago. He was elected governor in 2002, the first Democrat to win the office since Dan Walker's victory 30 years earlier. Blagojevich was impeached and removed from office for corruption; he solicited bribes for political appointments, including Barack Obama's vacant U.S. Senate seat after Obama was elected president in 2008. Blagojevich was convicted and sentenced to 14 years in federal prison. Blagojevich graduated from Chicago's Foreman High School after transferring from Lane Technical High School. He played basketball in high school and participated in two fights after training as a Golden Gloves boxer. After graduation, he enrolled at the University of Tampa. After two years, he transferred to Northwestern University in suburban Evanston, where he graduated in 1979 with a B.A. in history. He earned his J.D. from the Pepperdine University School of Law in 1983. He later said of the experience: "I went to law school at a place called Pepperdine in Malibu, California, overlooking the Pacific Ocean — a lot of surfing and movie stars and all the rest. I barely knew where that law library was." Blagojevich is married to Patricia Mell, the daughter of former Chicago alderman Richard Mell. Fighting as a 160-pound middleweight, Blagojevich began fighting in non-tournament "smokers" in January 1974. After defeating Patrick McAlinden, Leonard Bassuk, and Ronald Dimino over a year's time, Blagojevich felt he had enough experience to enter the local Golden Gloves Boxing Tournament. On February 24, 1975 at St. Andrews Gym, Blagojevich won his opening night match in the middleweight division by decisioning Thomas Muhme in 3 rounds. This win enabled Blagojevich to advance to the next round of the tournament. The next night, Blagojevich lost to Patrick Porter by 3rd-round technical knockout. Porter's aggressive punching attack had Blagojevich covering up his face with his boxing gloves. Because Blagojevich did not return punches, the referee stopped the match (with Blagojevich still on his feet), and awarded it to Porter. In 1992, with the backing of his influential father-in-law, Blagojevich toppled 14-year incumbent Myron Kulas in the Democratic primary for the 33rd state house district, in the Illinois House of Representatives, which includes part of Chicago's North Side. As is the case in most elections in the Chicago area, this virtually assured him of election in November. He drew on his experiences as a prosecutor to draft bills that he argued would strengthen the state's judicial system and reduce crime. In 1996, Blagojevich surrendered his seat in the state house to campaign in Illinois's 5th congressional district, based on the North Side. The district had long been represented by Dan Rostenkowski, who served as chairman of the House Ways and Means Committee. Rostenkowski was defeated for re-election in 1994 after pleading guilty to mail fraud and had been succeeded by Republican Michael Patrick Flanagan. However, Flanagan was a conservative Republican representing a heavily Democratic district, and was regarded as a heavy underdog. Blagojevich soundly defeated Flanagan by a nearly 2-to-1 margin, with support from his father-in-law. He was elected two more times, taking 74% against a nominal Republican challenger in 1998 and having only a Libertarian opponent in 2000. 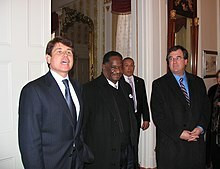 Blagojevich (left) with Emil Jones (center) and Jeffrey Schoenberg (right) at the Illinois Executive Mansion for a luncheon after Barack Obama launched his 2008 campaign in 2007. From 2005 to 2006, Blagojevich served as federal liaison for the Democratic Governors Association. Numerous scandals brought the governor's approval rating as low as 36 percent, with 56 percent disapproving near the end of 2005. In 2005, Blagojevich also served as a Chair of Midwestern Governors Association. In 2004, Blagojevich had ordered the Illinois Tollway to erect 32 signs at a cost of $480,000, announcing " Open Road Tolling. Rod R. Blagojevich, Governor." In 2006, the signs were criticized for serving as campaign signs and costing significantly more than the common $200 signs. Quincy mayor John Spring appears at a press conference with Blagojevich to discuss Mississippi River flood-relief efforts in 2008. Blagojevich with then Congressman, then Mayor Rahm Emanuel (D-Chicago) advocating for changes in Medicare legislation. During his February 2006 "State of the State" address, Blagojevich said the state should ban semi-automatic firearms. Anybody who doesn't think Winfrey would be a great senator from Illinois or anywhere is crazy. She gets along with everybody. She brings people together. She finds common ground. She's way past race politics 20 years ago. She's so far ahead of most people in human relations. And she listens ... I think she is up there with Will Rogers and Bob Hope and some of our great public personalities of the last century. Under the direction of U.S. Attorney Patrick Fitzgerald,  Governor Blagojevich was arrested at his home by federal agents on December 9, 2008, and charged with corruption. The Justice Department complaint alleged that the governor conspired to commit several " pay to play" schemes, including attempting "to obtain personal gain ... through the corrupt use" of his authority to fill the United States Senate seat vacated by Barack Obama following his election as president, claiming that in wiretapped recordings Blagojevich discussed his desire to get something in exchange for an appointment to the seat. After various outreach efforts, he appointed former state attorney general Roland Burris on New Year's Eve 2008. Burris was seated after some initial opposition in mid-January 2009. A trial was set for June 3, 2010,  and U.S. Attorney Patrick Fitzgerald spoke out on the charges,  characterizing Blagojevich's actions as trying to auction the open seat off to "the highest bidder". On January 27, 2009, Blagojevich began a media campaign planned by publicist Glenn Selig. During the two-day campaign, he visited Today, Good Morning America, The Early Show, The View, multiple programs on Fox News Channel, CNN and MSNBC where he proclaimed his innocence and insisted he would be vindicated. Blagojevich was indicted by a federal grand jury in April 2009. Most of the charges related to attempts to sell the Senate seat vacated by then-President-elect Barack Obama. On August 17, 2010, he was convicted on one of the 24 federal charges, a charge of lying to the FBI, and the jury was hung on 23 other counts. The defense did not call a single witness, claiming that prosecutors did not prove their case. Because the jury could not agree on the remaining charges, a mistrial was ordered for those counts. Within 15 minutes after the mistrial was declared, the prosecution team announced that they would definitely pursue a retrial on the 23 mistrial counts. A post- verdict court date was set for August 23, 2010. ^ "BLAGOJEVICH, Rod R. – Biographical Information". Bioguide.congress.gov. Retrieved December 8, 2011. ^ "So it's 'Milorad' is it?". Chicago Tribune. August 3, 2010. ^ "Why the GOP Lost IL-14". RealClearPolitics. March 12, 2008. ^ "Rod Blagojevich Biography". Biography.com. A&E Networks. ^ a b c Copley News Service. Three Democrats battle for party's nomination for governor. March 9, 2002. ^ "Hercegovac pokušao prodati Obaminu senatorsku funkciju". SAN Dnevne Novine (in Bosnian). Retrieved January 9, 2009. ^ a b c d Long, Ray; Christi Parsons (October 25, 2006). "Pulling No Punches". Chicago Tribune. Retrieved November 1, 2014. ^ "Burris Defends His Evolving Description of Talks" by Monica Davey, The New York Times, February 16, 2009, p. A9 NY edition. Retrieved 2-15-09. ^ Blog entry by Josh Goodman of Governing magazine. ^ "Chicago Tribune". Blogs.chicagotribune.com. August 3, 2010. Retrieved December 8, 2011. ^ Goldman, Russell (December 11, 2008). "Blagojevich's Past Paved With Allegations". ABC News. Retrieved December 11, 2008. ^ Profile on the website Archived June 15, 2007, at the Wayback Machine of biographer Carol Felsenthal. ^ Felsenthal, Carol (November 1, 2003). "Governor Sunshine". Chicago Magazine. Retrieved April 20, 2015. ^ "Blagojevich defends Reagan votes". Associated Press. June 12, 2004. Archived from the original on April 21, 2015. Retrieved April 20, 2014. ^ a b c d "Rod Blagojevich Amateur Boxing Record". Boxing-Scoop.com. Retrieved January 12, 2014. ^ a b c d e f g h i j k l m n o p Bernstein, David (February 2008). "Mr. Un-Popularity". Chicago Magazine. Retrieved November 14, 2013. ^ Governor-Elect Rod Blagojevich Cheesecake reprinted from campaign website: http://www.rodforus.com. IADDA.org. Retrieved December 10, 2008. ^ Tomma, Stephen (May 8, 2005). "Blagojevich for president?". Northwest Indiana and Illinois Times. Retrieved November 9, 2008. ^ "4 Nov 1992, Page 5 - Herald and Review at Newspapers.com". ^ Babwin, Don (December 10, 2008). "Arrest of Ill. governor puts spotlight on his wife". The Seattle Times. Associated Press. Retrieved October 19, 2010. ^ "2002 Gubernatorial Democratic Primary Election Results – Illinois". Uselectionatlas.org. Retrieved June 4, 2010. ^ a b c Saskow, Eli (December 12, 2008). "Obama Worked to Distance Self From Blagojevich Early On". Washington Post. Retrieved December 14, 2008. ^ a b c d e Tapper, Jake (December 9, 2008). "Questions Arise About the Obama/Blagojevich Relationship". ABC News. Retrieved December 9, 2008. ^ a b Saulny, Susan (December 10, 2008). "A Portrait of a Politician: Vengeful and Profane". New York Times. Retrieved December 10, 2008. ^ a b c Lin, Joanna (December 10, 2008). "Blagojevich ran on an anti-corruption platform". Los Angeles Times. Retrieved December 10, 2008. ^ "Results of SurveyUSA News Poll #6930". Surveyusa.com. Retrieved June 4, 2010. ^ a b "Removing a governor". Chicago Tribune. October 28, 2007. Retrieved November 8, 2008. ^ a b c Pearson, Rick; Ray Long (August 6, 2008). "Blagojevich calls special session for next week". Chicago Tribune. Retrieved November 7, 2008. ^ a b c Cillizza, Chris (December 10, 2008). "A Tale of Two Ads". The Washington Post The Fix blog. Retrieved December 10, 2008. ^ Darin, Jack (November 4, 2006). "Thinking of Going Green on Tuesday? Think Again". Illinois Sierra Club blog. Retrieved December 11, 2008. ^ Hawthorne, Michael (October 30, 2006). "Ecology questions crop up in race for governor". Chicago Tribune. Retrieved December 11, 2008. ^ a b Monica Davey (December 14, 2008). "Two Sides of a Troubled Governor, Sinking Deeper". The New York Times. ^ a b Christopher Wills (December 14, 2008). "Ill. governor: Eager for battle, rarely victorious". Associated Press. ^ Riopell, Mike (December 10, 2008). "History repeats itself: Blagojevich not the first Gov. to be charged while in office". Bloomington Pantagraph. Archived from the original on February 5, 2009. Retrieved December 10, 2008. ^ Chase, John; David Mendell (October 30, 2006). "Wielding a bully wallet: Blagojevich uses incumbency to spread wealth to potential voters". Chicago Tribune. Retrieved December 11, 2008. ^ a b Pearson, Rick (September 8, 2006). "Blagojevich denounces critics as `scoundrels'". Chicago Tribune. Retrieved December 11, 2008. ^ Outline of Death Penalty Archived October 9, 2006, at the Wayback Machine moratorium and reform in Illinois. ^ Reprint of Archived October 10, 2006, at the Wayback Machine Chicago Defender at the Illinois Coalition to Abolish the Death Penalty website. ^ Carlos Hernandez Gomez (August 15, 2008). "Blagojevich a Brutha?". Chicagoland-TV. Archived from the original on January 19, 2013. ^ a b McKinney, Dave (March 22, 2007). "Lieutenant gov breaks ranks on gross receipts tax". Chicago Sun-Times. Archived from the original on March 28, 2007. Retrieved November 7, 2008. ^ a b Davey, Monica; Jack Healy (December 9, 2008). "Illinois Governor Charged in Scheme to Sell Obama's Seat". New York Times. Retrieved December 10, 2008. ^ "Eight trips = $76,000". Dan Rutherford official campaign site. Associated Press. June 21, 2007. ^ a b c d Wills, Christopher (July 10, 2007). "Illinois Democrats turn on each other". USA Today. Associated Press. Retrieved November 7, 2008. ^ Shear, Michael D.; Chris Cillizza (December 10, 2008). "Obama Tries to Stay Above the Hometown Fray". The Washington Post. Retrieved December 10, 2008. ^ Blackledge, Brett J.; Tammy Webber (December 20, 2008). "Senate-for-sale case threatens new chief of staff". Associated Press. Retrieved December 20, 2008. ^ a b Garcia, Monique (September 15, 2008). "Blagojevich: 'I don't think I'm cuckoo'". Chicago Tribune. Retrieved November 8, 2008. ^ "Exploiting the Rod curse". Chicago Tribune. October 28, 2008. Retrieved November 8, 2008. ^ a b Davis, Eric (February 23, 2006). "Ill. governor confused by 'Daily Show' bit". USA Today. Associated Press. Retrieved July 17, 2007. ^ "Pill of Rights". The Daily Show. February 9, 2006. ^ Froemling, Todd (March 2, 2006). "Blagojevich drops ball on 'The Daily Show'". Daily Vidette. Retrieved July 17, 2007. ^ "New Illinois law affects SURS retirement benefits". News.uiuc.edu. Archived from the original on October 12, 2008. Retrieved June 4, 2010. ^ a b c Long, Ray; Jeffrey Meitrodt (February 21, 2005). "Blagojevich budget speech combination of deja vu, new tax breaks". Chicago Tribune. Retrieved November 7, 2008. ^ Ray Long (September 18, 2008). "Blago has never visited a state park". Associated Press. Archived from the original on December 1, 2008. ^ Erickson, Kurt (September 20, 2008). "Kurt Erickson: For Blagojevich, red tape may actually be a good thing". Southern Illinoisan. Retrieved November 8, 2008. ^ "Statewide Budget Veto Hearing Release" (PDF) (Press release). Illinois House of Representatives. September 6, 2007. Archived from the original (PDF) on March 25, 2009. Retrieved December 9, 2009. ^ a b "Judges settle pay increase lawsuit". Daily Vidette. January 26, 2005. Archived from the original on February 12, 2009. Retrieved November 8, 2008. ^ a b Rackl, Lori (December 31, 2005). "Illinois' flu vaccine finally delivered – to Pakistan: Gov's order from Britain last year barred by FDA, so state donates it". Chicago Sun-Times. Archived from the original on October 25, 2012. Retrieved November 9, 2008. ^ Einhorn, Catrin (December 18, 2008). "Illinois Inquiry Goes Beyond Criminal Complaint". The New York Times. Retrieved December 19, 2008. ^ Davy, Monica (August 17, 2004). "Illinois to Help Residents Buy Drugs From Canada, and Afar". New York Times. ^ "Plan B: Walgreens pharmacist flap dissected". Upi.com. February 1, 2006. Retrieved December 8, 2011. ^ Peres, Judy (October 11, 2007). "'Morning-after' pill deal reached". Chicago Tribune. Archived from the original on October 13, 2007. Retrieved January 7, 2008. ^ Morr-Fitz, Inc. v. Quinn , 976 N.E.2d 1160 (Ill. Ct. App. 2012). ^ Keith, Ryan (October 24, 2005). "'All Kids' insurance to dominate veto session". Northwest Indiana and Illinois Times. Retrieved November 8, 2008. ^ "All Kids program". Allkids.com. Retrieved June 4, 2010. ^ a b c Christopher, Wills (May 11, 2007). "House does more than thump Gov. 's gross receipts tax". The Lincoln Courier. Archived from the original on November 3, 2007. Retrieved November 9, 2008. ^ "Featured Article". Opinionjournal.com. May 14, 2007. Retrieved January 31, 2009. ^ "Ill. gov. can get new lawyers for health plan case". Chicago Tribune. October 24, 2008. Archived from the original on February 3, 2009. Retrieved November 7, 2008. ^ "Illinois Legislative Committee Rejects Gov. Blagojevich's FamilyCare Expansion". Kaiser Foundation. February 28, 2008. Archived from the original on June 4, 2009. Retrieved November 7, 2008. ^ a b O'Connor, John (October 7, 2008). "Illinois pharmacists pay for Blagojevich's bungling". The Pantagraph. Archived from the original on February 5, 2009. Retrieved November 7, 2008. ^ "Blagojevich should get the bill". The Pantagraph. October 13, 2008. Retrieved November 10, 2008. ^ O'Connor, John (October 23, 2008). "Blagojevich mum on FamilyCare health program". Associated Press. Archived from the original on October 25, 2008. Retrieved November 7, 2008. ^ "Illinois agrees to pay fees in video game industry suit". Northwest Indiana and Illinois Times. December 21, 2006. Retrieved November 8, 2008. ^ Gov. Rod Blagojevich (August 20, 2007). "Veto of SB0540". Retrieved January 23, 2009. ^ "Illinois Threat to Bank of America Is Dangerous, Critics Say". Bloomberg. December 9, 2008. Retrieved December 12, 2008. ^ "In Gun-control Showdown, Some Are Slow To Pull Trigger". ^ "Blagojevich vetoes series of proposed gun laws". Arlington Heights Daily Herald. August 2005. Archived from the original on September 24, 2015. Retrieved November 14, 2013. ^ "Part 2 of Gov. Blagojevich on 'Glenn Beck'". Fox News. January 29, 2009. Archived from the original on February 7, 2009. Retrieved January 31, 2009. ^ "Gov. Blagojevich: 'I Know I've Done Nothing Wrong'". Fox News. January 27, 2009. Archived from the original on January 31, 2009. Retrieved January 31, 2009. ^ "Oprah 'Absolutely Not' Interested In Senate Seat". WBBM 780. January 26, 2009. Archived from the original on February 11, 2009. Retrieved January 31, 2009. ^ "'Hardball with Chris Matthews' for Monday, January 26". MSNBC. January 26, 2009. Retrieved January 31, 2009. ^ Zorn, Eric (May 31, 2007). "Gov. Nocommentevich". Chicago Tribune. Retrieved October 19, 2008. ^ Donahue, Wendy (November 13, 2005). "Tie right" (PDF). The Chicago Tribune. Retrieved November 22, 2008. ^ Alison Frankel All Articles (December 11, 2008). "U.S. Attorneys Patrick Fitzgerald of Chicago and James Comey of Manhattan are both tough-minded career prosecutors. They're also best friends – American Lawyer – December 11, 2008". Law.com. Retrieved December 8, 2011. ^ Illinois Gov. Blagojevich, chief of staff, arrested Chicago Tribune, December 9, 2008. ^ Fusco, Chris (June 25, 2008). "Judge sets Blagojevich trial date". Chicago Sun-Times. Archived from the original on June 28, 2009. Retrieved September 23, 2009. ^ "Justice Department Briefing on Blagojevich Investigation". New York Times. December 9, 2008. Retrieved August 14, 2009. ^ Vote on House Resolution 1671 to impeach Gov. Blagojevich. ^ Harris, Paul (August 18, 2010). "Rod Blagojevich guilty on just one count of 24 in corruption trial". The Guardian. London. ^ Chicago Tribune, January 30, 2009, "Impeached Illinois Gov. Rod Blagojevich Has Been Removed From Office" by Ray Long and Rick Pearson. ^ a b Chicago Tribune, August 18, 2010, p. 1, "Several panelists dissatisfied, point to lack of smoking gun' by Annie Sweeney, Vikki Ortiz Healy and Noreen S. Ahmed-Uilah. ^ Ormsby, David (April 13, 2009). "Quinn Manages to be Frugal and Generous Simultaneously". Davidormsby.wordpress.com. Archived from the original on September 21, 2009. Retrieved June 4, 2010. ^ "Blagojevich Reality Show: Judge Denies Permission To Travel To Costa Rica For Show". Huffington Post. April 21, 2009. Retrieved June 4, 2010. ^ "NBC recruits Blagojevich for 'Celebrity'". The Live Feed. April 15, 2009. ^ Barr, Andy (April 6, 2009). "Blagojevich: Spider meal an 'act of love'". Politico. Retrieved June 5, 2009. ^ Blagojevich, Rod (September 8, 2009). The Governor: The Truth Behind the Political Scandal That Continues to Rock the Nation. Phoenix. ISBN 978-1597776462. ^ Staff Writer (July 30, 2009). "Blagojevich book due for release". UPI. Retrieved July 30, 2009. ^ Ortiz, Vikki (July 30, 2009). "Rod Blagojevich's book: Ousted governor's work, due in September, available on Amazon.com". Chicago Tribune. Archived from the original on August 2, 2009. Retrieved August 18, 2009. ^ a b "Blagojevich to host talk radio show on 2 Sundays". The Pantagraph. Associated Press. July 17, 2009. Retrieved May 20, 2017. ^ "Blagojevich talker continues on WLS-AM". Radio+Television Business Report. July 31, 2009. Retrieved May 20, 2017. ^ Cox, Ted (March 25, 2010). "Rod Blagojevich, media star: 2-hour stint on WLS used to attack Quinn". Daily Herald. Retrieved May 20, 2017. 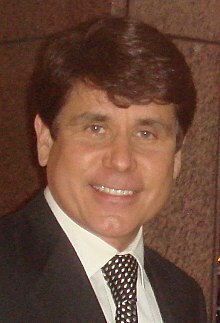 ^ "WLS radio shuts off Blago's mike". Chicago Sun-Times. June 3, 2010. Retrieved May 20, 2017. ^ "Donald Trump predicts former gov Rod Blagojevich will be 'Celebrity Apprentice 3's' breakout star". The New York Daily News. January 5, 2010. Retrieved January 16, 2010. ^ "'Episode 904 Recap'". NBC Universal. April 5, 2010. Archived from the original on March 23, 2010. Retrieved April 5, 2010. ^ Winter, Michael (January 11, 2010). "Blagojevich backpedals for saying he's 'blacker than Obama'". USA Today. Retrieved January 16, 2010. ^ Johnston, Rich (August 21, 2010). "Rod Blagojevich Meets Batman At Wizard World Chicago Comic Con (VIDEO)". bleedingcool.com. Retrieved August 22, 2010. ^ "Wizard World Chicago Comic Con, Saturday: Tales from the front lines". Time Out Chicago. August 22, 2010. Archived from the original on August 25, 2010. Retrieved August 22, 2010. ^ "Superseding Indictment (U.S. v. Rod Blagojevich, et al". FindLaw. April 2, 2009. Retrieved April 2, 2009. ^ Associated, The. "Jury convicts Blagojevich of attempting to sell Obama's senate seat – Haaretz Daily Newspaper | Israel News". Haaretz. Israel. Retrieved December 8, 2011. ^ Coen, Jeff (June 25, 2011). "Blagojevich Jury's Silence Prompts Speculation". Chicago Tribune. ^ Belkin, Douglas and Stephanie Banchero (June 27, 2011). "Blagojevich Convicted on Corruption Charges". The Wall Street Journal. Retrieved June 28, 2011. ^ Secter, Bob and Jeff Coen (June 27, 2011). 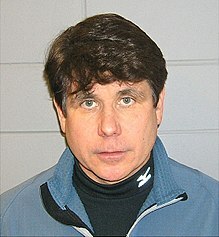 "Blagojevich convicted: 'I, frankly, am stunned,' former governor says after jury convicts him on 17 counts". Chicago Tribune. Retrieved June 28, 2011. ^ "Blagojevich sentenced to 14 years in prison". Chicago Tribune. Archived from the original on January 20, 2012. ^ "Inside Blago's New Home". CBS. ^ " Inmate Locator." Federal Bureau of Prisons. Retrieved on June 9, 2015. Type in the number, or "Rod" and "Blagojevich". ^ "18 U.S. Code § 3624 - Release of a prisoner". www.law.cornell.edu. Cornell Law School. Retrieved December 9, 2017. ' ... a prisoner ... may receive credit toward the service of the prisoner's sentence, beyond the time served, of up to 54 days at the end of each year of the prisoner's term of imprisonment, beginning at the end of the first year of the term, subject to determination by the Bureau of Prisons that, during that year, the prisoner has displayed exemplary compliance with institutional disciplinary regulations.' Note 54 days is 15% of a year. ^ "What's the matter with Illinois? With Blagojevich conviction, state has most imprisoned governors". The Washington Post. June 28, 2011. ^ Annie Sweeney (December 9, 2011). "Blagojevich attorneys consider prison and appeal". Chicago Tribune. ^ Michael Tarm. "Blagojevich appeals convictions, stiff sentence". Associated Press. Retrieved July 16, 2013. ^ "Rod Blagojevich convictions vacated on 5 counts; Not eligible for release during re-trial'". WLS-TV. July 21, 2015. ^ Jacob Meisner, Blagojevich to appeal to Supreme Court after 7th Circuit denies rehearing, Chicago Tribune (August 19, 2015). ^ Jacob Meisner (March 28, 2016). "U.S. Supreme Court denies Blagojevich appeal; Patti 'incredibly disappointed'". Chicago Tribune. ^ Patrick M. O'Connell & Jason Meisner, Rod Blagojevich's 14-year prison sentence upheld; family 'dumbfounded and flabbergasted', Chicago Tribune (August 9, 2016). ^ Tarm, Michael. "Blagojevich again asks Supreme Court to hear his appeal". chicagotribune.com. Retrieved May 31, 2018. ^ "NBC 5 Exclusive: Blagojevich Breaks Silence From Prison". NBC Chicago. Retrieved May 31, 2018. ^ Coen, Jeff. "Blagojevich, unrepentant but bruised, reflects on prison life". chicagotribune.com. Retrieved May 31, 2018. ^ "(EXCLUSIVE) Blago: His Life in Prison". Chicago magazine. Retrieved May 31, 2018. ^ "Statements from Patti Blagojevich, attorney on today's Rod Blagojevich appeal to U.S. Supreme Court | #PRNC". www.prnewschannel.com. Archived from the original on July 21, 2018. Retrieved May 31, 2018. ^ News, ABC. "Supreme Court again refuses to hear Blagojevich appeal". ABC News. Retrieved April 16, 2018. ^ Diamond, Jeremy (May 31, 2018). "Trump floats Martha Stewart pardon, Rod Blagojevich commutation". CNN. ^ Tatum, Sophie (June 5, 2018). "Ex-Gov. Blagojevich officially asks Trump to commute his prison sentence". CNN. Retrieved February 11, 2019. Wikimedia Commons has media related to Rod Blagojevich.